A Star Structures portable, open faced horse barn makes it easy to temporarily or permanently relocate horses for herd control, breeding programs or grazing preferences. Get more control over your herd with these cost effective protection solutions for your horses. 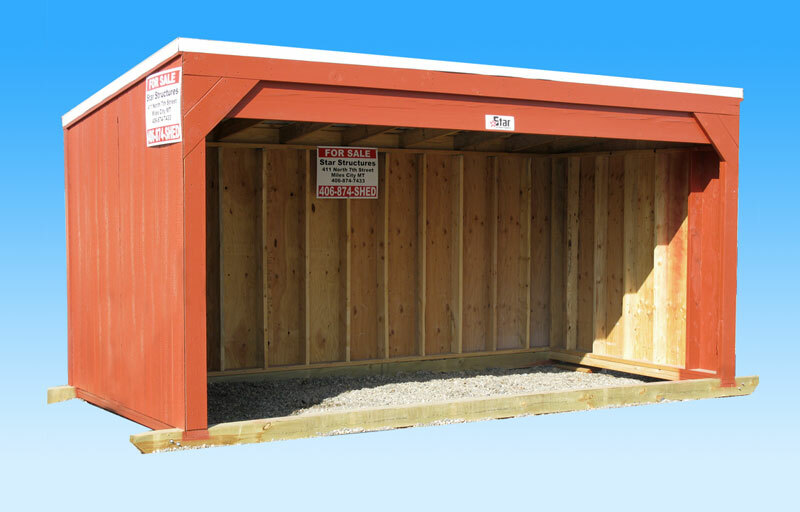 The Economy portable horse barn features exterior grade plywood sides and metal roofing. The Premium portable horse barn features 29 gauge metal siding and roofing. Both Star Structures portable horse barn models are built 'Montana Tough,' and have been engineered and constructed to endure harsh weather and high winds. Star Structures recommends anchoring your portable horse barn using standard anchor kits, which can be easily and firmly attached to the treated 6" x 6" skids. Prices include delivery to the Mile City, Montana area.